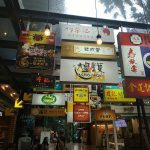 Recently during my trip to Air Asia LCCT (Low Cost Carrier Terminal) in Sepang, I was looking for a place to have lunch before my flight. 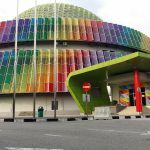 Upon reaching the LCCT, I immediately checked in my luggage- then with my hand carry, I proceeded to the food court in LCCT- it is located in another building- further down from where the buses stop. The food court was relatively deserted. I was curious to know about the pricing of the food in the food court compared to the one in the airport. 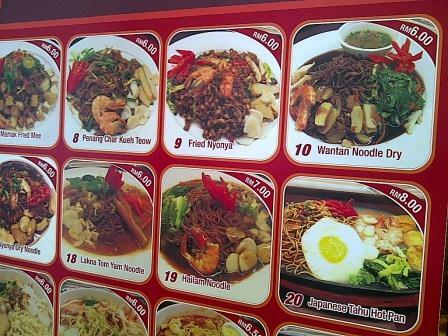 If you want food with standard price- you can opt for these fixed price items: Penang Char Kueh Teow (RM6), Wantan noodle dry (RM6), Nyonya Dried Noddle (RM6), Laksa Tom Yam noddle (RM6), Hailam Noodle (RM7), Japanese Tofu hot pan (RM8). 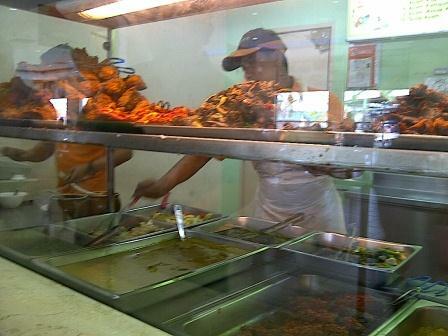 For me, I opted the above mixed rice- instead of the standard priced dishes. Black Coffee RM2.30, Ipoh White Coffee RM2.30, Hot milo (RM2.30), hot teh tarik (RM2.30) & Cappuccino (RM2.30), bottled water- RM1.40. Others: Mocca RM3.00, iced milo & soft drinks RM2.30. 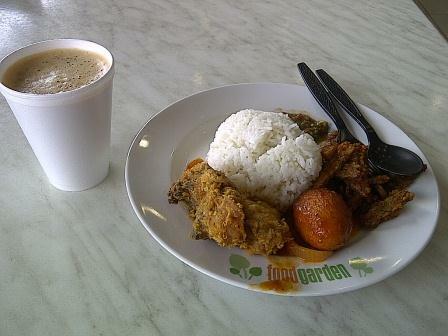 Other food price: bubur ayam (chicken porridge) RM4, chicken/ meat murtabak RM7. If you buy just a plain roti canai from the main buidling, I have seen that it cost RM12. Note: You may not want to buy bottled water unless you intend to finish the entire bottle if you are planning to take a flight because you would need to dispose it at the security check-in since no fluids are allowed. Alternatively, if you are early, you can also come here and go online to get some work done. There is air con and I am not mistaken there are wifi. 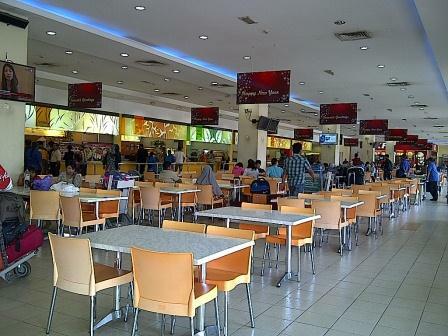 The food court is also connected to the announcement of flights departure and as you can see in the photo below, the flight details are also listed in the TV there. 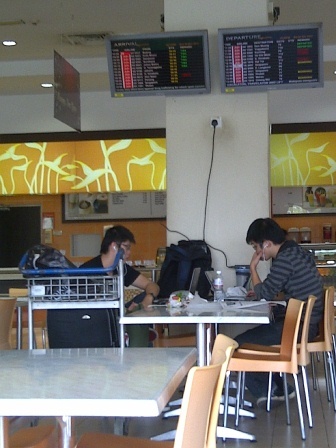 You can see those who are waiting for their flights getting their work done by connecting to the power source (the plug is quite high). I took the time to charge my Blackberry as well. 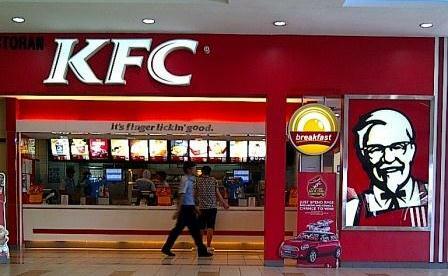 There’s also a KFC there- 3 pcs of chicken set and 2 pcs chicken set cost RM22.85 & RM19.85 respectively. 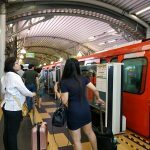 Therefore, it is not so bad if you have some time to kill and want to find a place to rest with a table for you to do some work while waiting for your flight. You can consider hanging around the food court, until the time to take your flight is here.